Samuel Cooper was born in New York in 1898, the son of a revolutionary serving as a major in Knox’s artillery. He died on Cooper’s Hill a Virginian and the highest ranking officer in the Confederate army, senior even to Lee. He entered the U.S. Military Academy at age 14, graduating in 1815. Like his father, he joined the artillery and was transferred to Washington City in 1821. His connection to Alexandria came in 1827, when he married George Mason’s granddaughter, whose family owned an estate at the top of the hill on Quaker Lane. His service in Washington included stints as chief clerk of the War Department and assistant adjutant general of the Army. He served in the Second Seminole War and the Mexican War. He became Adjutant General of the Army in 1852 and served briefly as Secretary of War in 1857 (his predecessor was Jefferson Davis). When Virginia seceded in 1861, he faced the same decision as his colleague Robert E. Lee (a friend and neighbor, related by marriage and both attending church at the Seminary). Like Lee, he chose to serve Virginia rather than Lincoln – – thus the army lost its best administrator just before it lost its best tactician. Resigning after 46 years of service on March 7, 1861 (and over a month before Virginia left the Union) he traveled to the Confederate capital in Montgomery and offered his services to his friend Jefferson Davis, now president of a coalescing Confederacy. He was immediately commissioned a general and tasked with organizing an army to defend the new nation. His early commission as a general officer made him the most senior and highest ranking officer in the army. The Yankees invaded Virginia and occupied Alexandria in May of 1861. Cooper’s estate Cameron was strategically located on a spur flanking the high ground on Seminary Ridge. The invaders occupied this terrain immediately, vandalizing the buildings and grounds. Many of these buildings would be serve as officers’ quarters and hospitals. Others, like Colonel Herbert’s Muckross and the Fairfax family’s Vaucluse, would be torn down and their bricks used to construct powder magazines for the earthwork forts going up on Seminary Ridge. Such was the fate of Cooper’s house, Cameron. Initially the estate was used as a campsite and hospital (local legend has it that the octagonal outbuilding on the grounds served as the “dead house” for the hospital, though other sources say it was neighboring Clarens). By now the land had been confiscated by the Federal government and was known as “Traitor’s Hill” in reference to the fact that Cooper was the highest ranking Union officer to join the Confederacy. He also lost a farm he had inherited in New York. In 1863, “Fort Traitor” went up on the site, Cooper’s house being razed to use the bricks in the construction of a large powder magazine. At the behest of Cooper’s son-in-law, a general in the Union army, the fort was later renamed Fort Williams in honor of Thomas Williams, killed at Baton Rouge in August 1862. It was a roughly hexagonal earthwork with emplacements for 13 guns, 250 yards in perimeter, with a brick magazine covered with a thick earthen mound in the center. Robert Knox Sneden’s outline from 1863 depicts the foundations of the house as almost a part of the fort, with part of the enclosure open to the northwest, differing from the neat official plan. It flanked Fort Worth on the next hill and commanded Duke Street, the railroad and the heights beyond. It was an anchor at one end of a line of obstructions stretching across the valley of Hunting Creek to Fort Lyon (Huntington Metro stop), a line designed to block and prevent Confederate cavalry raids on the rail depot and warehouses of Alexandria. A line of trenches and batteries extended north towards the Seminary to cover the ravine flanking Fort Worth. 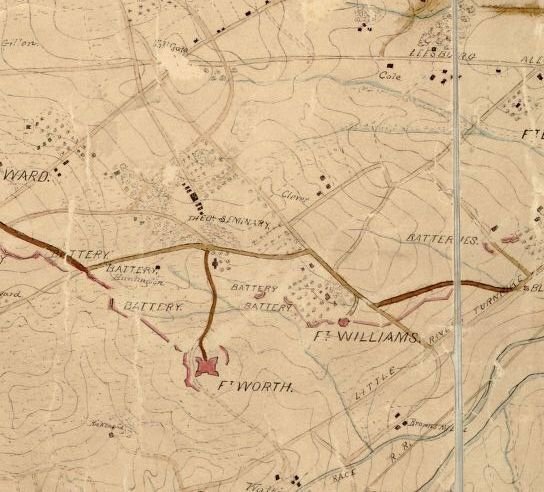 An advance work in the shape of a “w” was down the hill south of the fort, while a line of trenches to the south paralleled Quaker Lane. Another line of trenches tracked the top of the hill to the east, battery emplacements beyond at Bishop Ireton, with Fort Ellsworth on Shuter’s Hill anchoring the line. Today, all that remains of the fort is its magnificent powder magazine. Cooper Dawson, a descendant of Cooper’s who lived on the property, told me in the 1970s that the old man hated that fort and spent the rest of his post-war days leveling the earthworks. 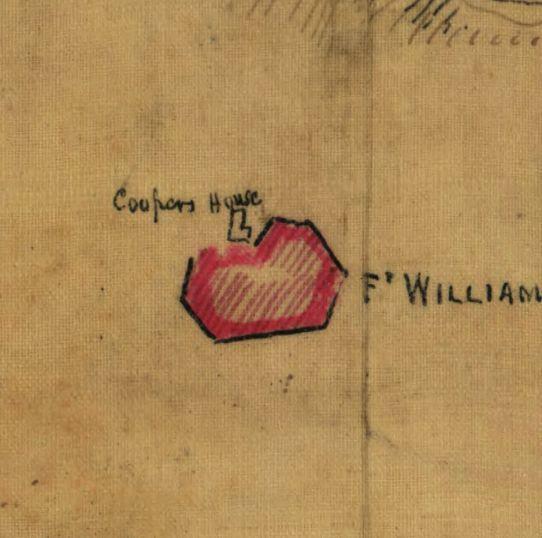 The foundations of Cooper’s house were still there in the ’70s, as was a stub of trench line connecting the fort to the line on Quaker Lane, and the “w” shaped work down the hill — I fear these are gone now. At the crest of the hill in Fort Williams Park there is a sunken trench or battery, a good workout if you want to see it. Cooper ended the war as part of Jefferson Davis’ band on the run, surrendering in May 1865 in North Carolina. He made a major contribution to American history by preserving and turning over the official records of the Confederate army. Ironically, Harper’s 1866 History of the Great Rebellion gives him only the slightest footnote, dismissing him as “a traitor to his state, as well as his nation” and completely failing to credit him with feeding and supplying the Confederate army for four years. After the war, he returned to Alexandria and was housed by friends in a house called the “Wilderness” at the Seminary. Eventually he was able to recover his estate when his friend W.M. Corcoran (the same guy who gave Washington the art gallery) purchased the property on his behalf. He lived in his former slave quarters (he had owned at least six slaves) to which the generous Corcoran added an addition. He was ruined financially, as reflected by a $300 gift in 1870 by former Confederates (including $100 from his friend Robert E. Lee), which would be about $25,000 today. He died on his hill in December 1876 and is buried in Christ Church cemetery. He never regained his United States citizenship.